Everything works so exceptionally well on this new hand coiled and painted vase by Glendora. 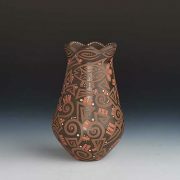 The painted symbols and the coloration of this jar are so eye catching. The spirals, fish, arrowheads, and geometrics all work so well together on this particular shape with the sculpted, scalloped lip. 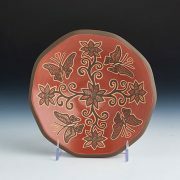 The browns and oranges, accented by cream colors are magnificent. The very narrow bottom, in contrast to the open neck is lovely. Glendora Fragua was born into a family of potters at the Jemez Pueblo in New Mexico. 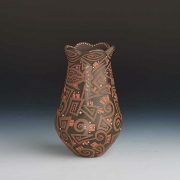 Her mother, the well known potter Juanita Fragua, was her main inspiration. So at the age of 16, Glendora tried her hand at pottery making.But unlike Juanita, Glendora experimented with the scratch technique of etched pottery called sgraffito. 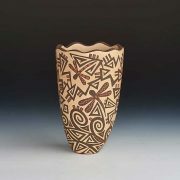 Her designs are created by scratching away part of the polished surface of the pot. She often sets tones (coral, turquoise, onyx, malachite, lapis) into the decorated portions of the pots.They are placed in the pot before firing, removed during that process, and then replaced after the firing. This is by far one of the most difficult of all decorating methods, but Glendora has become a master at it ! Her work shows both a delicacy and sophistication.